Soft and warm, but light weight. Bought for my daughter's bed and she loves it! Highly recommend. Outlast technology, originally developed for NASA, utilizes change phase materials (PCM) that absorb, store and release heat for optimal thermal comfort. Outlast technology buffers against temperature fluctuations, helping to keep your personal microclimate steady and comfortable. Outlast technology doesn’t just wick moisture away from the body—it helps to proactively manage sweat before it begins. When you overheat, your body naturally releases excess heat and sweats to cool the skin. Outlast helps alleviate these spikes in skin temperature that cause sleep disturbances by absorbing and storing the excess heat. As you cool, the stored heat is released back to the body for optimal thermal comfort. This cycle continues throughout the night, so you wake up feeling more refreshed and rested. More than just temperature regulating. With a super-soft sateen weave, this blanket will keep your bed comfortable and luxurious. The tight-knit weave also repels traditional allergens such as dust mites, which can disrupt sensitive sleepers. Get that cool, crisp, off-the-line freshness every single night. Order your Outlast Temperature Regulating Blanket today! Dimensions 108.0 In. X 90.0 In. X 0.25 In. Like other Outlast Temperature regulating products, this has been a great acquisition. After a stressful day at work, a good night rest is important to get refreshed for the next day and Outlast Temperature Regulating blanket helps with that. I have been sleeping so peacefully since I purchased this, it regulates your body temperature just as it says and I always look forward to getting on my bed with this blanket each night. You actually get to keep this on your body through the night, unlike other blankets you toss away when it gets too hot. It’s easy to wash and keep clean It’s totally worth the price you pay. Am very satisfied with my purchase and i will be purchasing more of this. I definitely recommend this blanket. It works. During the night, I often get hot flashes, so it’s important that I use the best bedding that will enable me to sleep comfortably. This blanket is another great product that is designed to provide comfort each night. I love waking up in the morning feeling so refreshed and relaxed. This appears to be as advertised, although I haven't tried it in different temperatures yet. It starts out looking and feeling like a quality duvet with down inside, but there's no stuffing. It is a smoothe, and tightly woven cotton exterior. It's very thin, so I imagine it's more of a "seal" over whatever you have under it - like wearing a rain jacket over your sweatshirt. That makes sense for its promise to regulate temperature, but I'll be using it with seasonal changing blankets underneath. It seems it would be a bother to wash all the time if you sweat or get it dirty, so I'll for sure use at least a sheet or liner between it and the person, which will probably affect any true review I could make on its performance in regulating temperature. It's a pretty, thin, soft, and will fit well on sofa beds to slide them back in. I would always end up kicking my blankets off at night, but not anymore! This blanket keeps me from getting too hot and sweating at night. I'm so grateful! I got this blanket as a gift and I couldn't ask for a better blanket! It's soft, cozy and makes me a lot more comfortable at night. I've been having hot flashes and I sleep hot; my husband is freezing. If I put too many blankets on for him, I overheat. This is the 2nd blanket I've bought. I got one for the RV for summer use and it worked so well at temperature control that I got another for the house. In the house it worked really well, better than the lightweight summer rated down comforter. For the winter, I just put the two together in a comforter cover. The cover was just flannel. 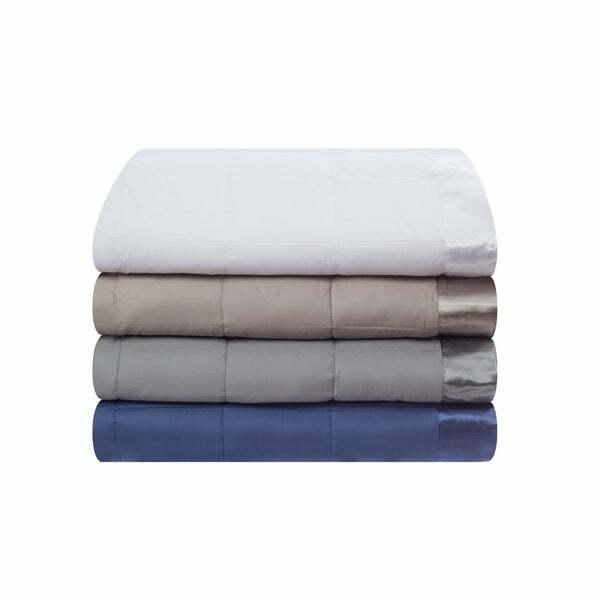 I use just one blanket in another comforter cover which is much thicker and heavier. So far I'm cool and husband is warm. There is a comforter avail but since I already had 2 blankets, I used them together instead of purchasing the comforter. I live in a hot humid climate and often times it's hard to sleep when the temperature is hot, but with outlast I don't have to kick the covers because it's too hot. On colder nights, it's so smooth and perfect for a bed weather. Love it! We purchased the Equilibrium Outlast Temperature Regulating Blanket, and we have been happy with the purchase so far. It is the thickness of a blanket, but it is the perfect temperature all of the time. I have yet to wake up uncomfortable while having it on. It just makes you warm but not sweaty. It really has been a good purchase for us so far. Great blanket! Warm but light. Has washed up well and kept its shape. This is a high-quality and beautiful blanket. Not too hot, not too cold. Very thin, but it works well... even in Wisconsin winters. Lightweight as well. I tend to be cold, he tends to be hot. We needed something breathable but that could keep me warm and didn't want to have not use separate blankets on the bed. this was a perfect solution and I can't recommend it enough. I didn't believe it would be very helpful, but I was pleasantly surprised. Have used for more than 6 months. I was very pleased with the color, feel & fast delivery of the blanket. This blanket is ok-very big-it is not as soft as I thought it would be and it does not cool as good as I would like it to-expensive and I don't think I would buy again for the price-just disappointed for the price I was wishing it was perfect. The color is very appealing. The blanket is light and still very warm. It does what it is advertised to do. I’ll buy more. Great purchase! Great price for quality of product. Blanket is soft and warm. Color was true to photo. Washes well and the neutral color compliments our décor nicely. I love this lightweight but warm blanket. I use it and a sheep and it’s perfect. This blanket is very light and just the right amount of warmth.I love it!!! This was to replace a similar blanket that we loved and have had for the past ten years. It's not heavy and breathes more than other blankets. This blanket has a very soft and silky texture. Has been working perfectly for me and my partner since I am usually colder and he is always bursting hot. It does not take much space when storaged and it's also very lightweight. "What are the dimensions of the full size blanket? I am trying to find a blanket that will fit a full size bed without dropping to the floor and having excessive material to tuck in when making the bed. The common full/queen size are just too big!!" The actual size in inches is listed - but, I can say it fits as you probably want and does not go to the floor it is only over hanging to the sides of a 10 inch mattress base. So- 8 to 10 inches off the sides. "What are the dimensions of the king & Queen?" The queen size is 90 x 90 and the king size is 110 x 90. "It says the color is white...but in the picture it looks slightly off-white or ivory. Can you tell me how "white" it really is? Like hospital white sheets??" Hello jds, the color does appear to be slightly off-white in my opinion. We try to represent the colors of our products accurately. Unfortunately, due to the difference in monitor colors we cannot guarantee that the color will match exactly what you see on your screen. Thank you for shopping with us. "I have an outlast blanket that is maybe 15 or 20 years old. It has no sateen cover and it pills up like a sweater. It is warm in a room that is in the 40's. Is the same type of product. All of these reviews say it keeps you cool in the heat but does not say it will keep you warm in the cold." Hello Ally549, we can appreciate the fact you want a firsthand account of the product. You will receive an email notification every time you get a response. Thank you for shopping with us. "Hi I was wondering if you have to use the temperature control in sheets for this blanket to be effective? Also is it possible to put a cotton duvet cover on top of the blanket?" Hello babakid, you do not need temperature controlling sheets. Yes this would work great in a cotton duvet. "Do you need to have temperature regulating sheets with it? Also can I use a cotton duvet cover on it?" Hello babakid, you do not need temperature regulating sheets. Yes you can use this in a cotton duvet cover. "What are the measurements for the QUEEN blanket? What are the measurements for the KING blanket? I really liked the reviews; I want to purchase it. Thank you, Debbie"
Hello Debbie G., the Queen is approximately 90 inches x 90 inches and the King is approximately 110 inches x 90 inches.Thank you for shopping with us.